i-manager’s Journal on School Educational Technology aim to induce the commitment of our educators in giving unparalleled education with quality and innovative ideas worldwide. 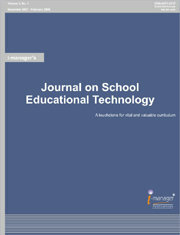 i-manager’s Journal on School Educational Technology reflects the most modern trends and researches in K-12 education to make the academic community stay current with the new trends. The ultimate goal of the Journal is breeding a dynamic, visionary and creative younger generation. New Teachers and Technology Preparation: Immersion or Infusion? BSCW As A Managed Learning Environment For International In-Service Teacher Education. Academicians, practitioners and post-graduate students in the field of Educational Technology, University Educational Bodies, Researchers, Consultants, leading Corporate etc.